The statistics are alienating, because we just read numbers and those distance us from the humanity of who these children are. We often hear or read that they have experienced “unspeakable horrors,” but when I meet these children, usually between the ages of 13 to 17, they often don’t wear the trauma on their faces. Some do, especially those who are sick. Several were coughing this week, couldn’t enjoy themselves. I think about them being kept in the “iceboxes” (detention centers) when they are first detained, or the “cages” that are supposedly not “cages” but are more like large dog kennels that they can stand up in or lie down in and have “facilities.” I think about the one meal a day they might eat, of a cold sandwich. I remember the first group of girls I met in 2014, who had been given only cookies and juice every day for the requisite 21 days they were kept in detention. This week, the children were all boys, in their mid to late teens. One boy was about to turn 18. This was not good. He would be sent back to the border on his 18th birthday. No longer a minor, he would not be eligible for sheltering and education any longer. Happy birthday. 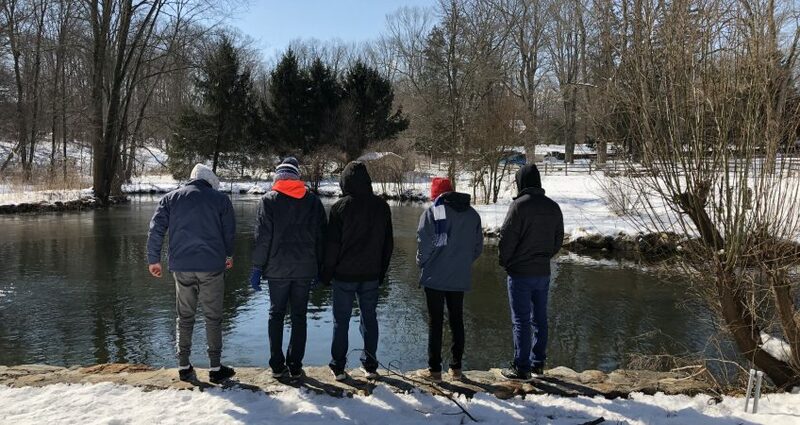 The boys were cold, they didn’t have any winter boots for the sub freezing temperatures and snow in New York, but they didn’t complain. They all had sneakers, and their feet were cold. We kept saying to one another, “Frio, frio, frio.” I can’t speak much Spanish, and they are supposed to be learning English, but I end up speaking my broken Spanish anyway, and they practice their broken English, and we do a lot of miming. 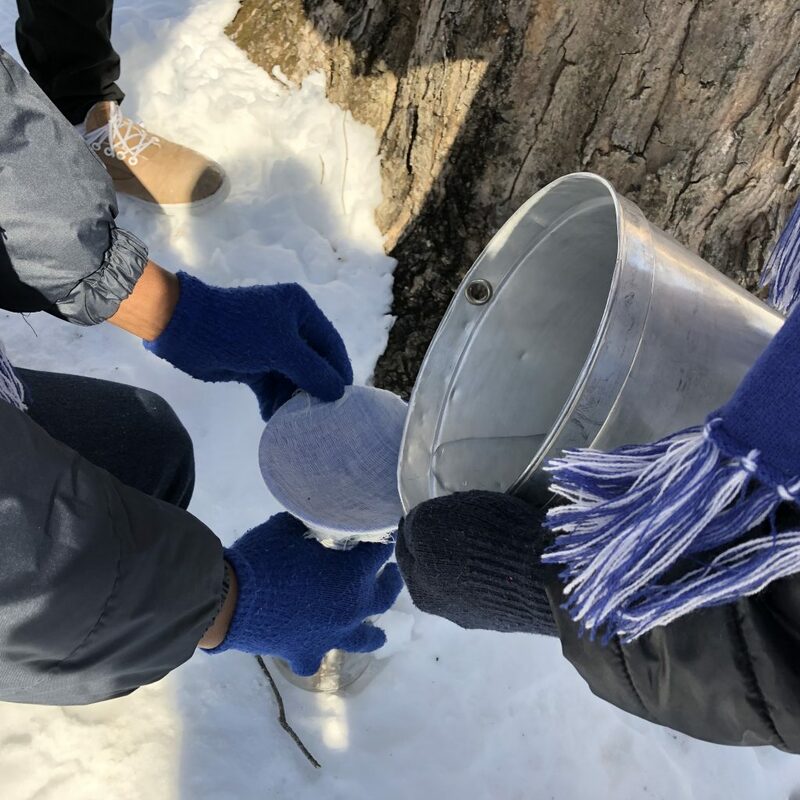 Yes, we collected sap from the trees and boiled it to make syrup, we collected eggs from the chickens and made pancakes with maple syrup, and yes they learned a lot of new information, how to eat locally and seasonally, how to make healthy choices, how to live sustainably in this part of the world. 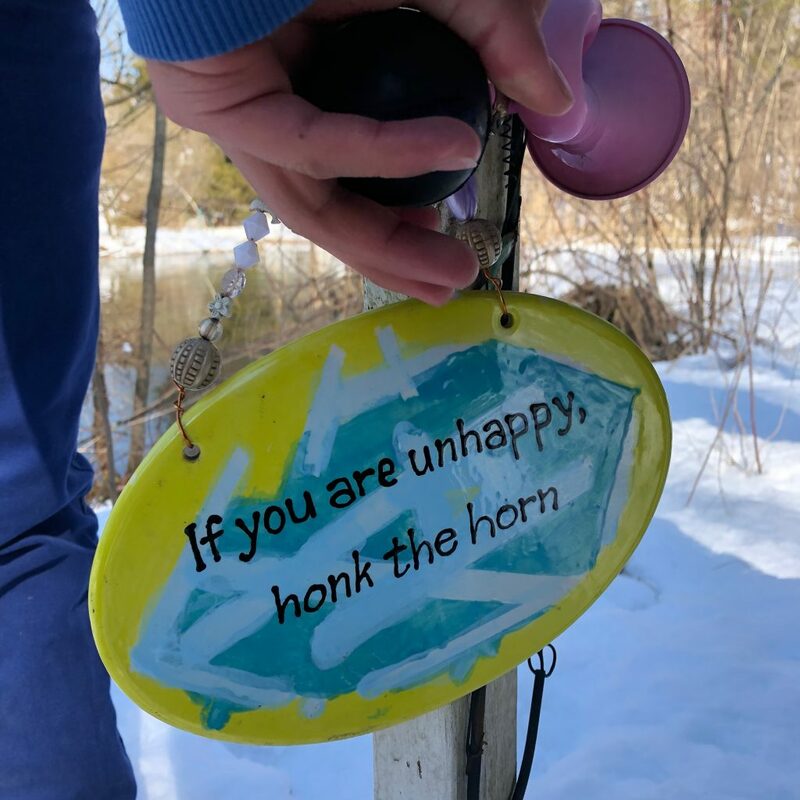 But that wasn’t what made me so happy this week. I love what we teach them, but what I loved this week was what they were compelled to do: play. They are children. And in this case, they were boys who had never played in the snow before, and so all they wanted to do was roll around in it, throw it at each other, slide down the hillside on it. I brought them sleds and they laughed and played for hours, they couldn’t not play. But they are children, and so they get silly, goofy, emotional, and they need to eat and play. I remember a line from a favorite book, “Yardsticks,” by Chip Wood, about children’s behavioral stages, and how for the 5-year old, in their minds, they only come to school to eat and to play. It’s the same for teenagers, I think. The more time they get to eat and play, the happier they are too. So I watched them tumbling in the snow, wrestling in the snow, throwing snowballs, tackling each other, putting snow down each other’s jackets, sledding, laughing, running, and not minding being freezing cold (not too much), and I kept thinking, they are children. 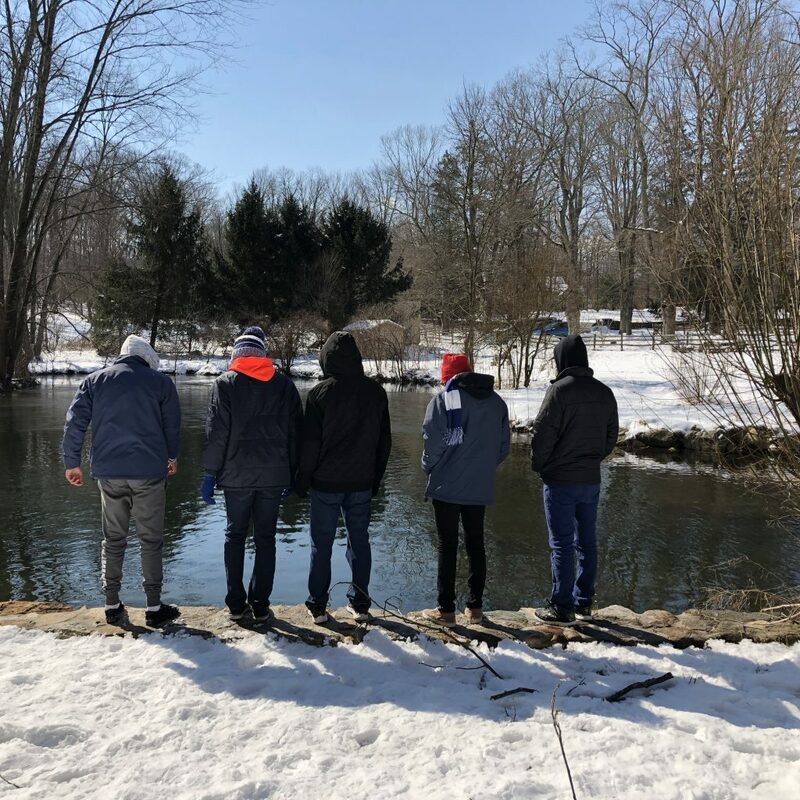 At one point as we were walking around the pond, talking about how there are fish and frogs, snakes and turtles, and all kinds of wildlife that is dormant for the winter, we asked the boys if they had any questions. “Preguntas?” Yes, one of them did. The translator told me the question, “How do the ducks walk on water?” They laughed; they’d never seen ducks walking on ice. The boys tested the ice with their sneakers, could they walk on water too? They are walking on water, I thought to myself. The miracle that they have made it this far is no less than that. This is so very moving. The pictures speak so eloquently, as well.. thank you. Thank you for writing and sharing this.. It’s beautifully written, what a journey these kids have been through already and they’re just kids..
Wow. So well told. So touching. So necessary to be heard and shared.